Home/Knowledge Base/Email/How to securely check email? How to securely check email? There are 2 types of email connection – with SSL and without SSL. To connect to our servers securely, you will need to tick two boxes in your email client. Continue reading this article on how to securely check email. Change both incoming and outgoing mail server to mail.domain.com (replace domain.com with your actual domain name) or the server name you are hosted in (refer to your welcome email). 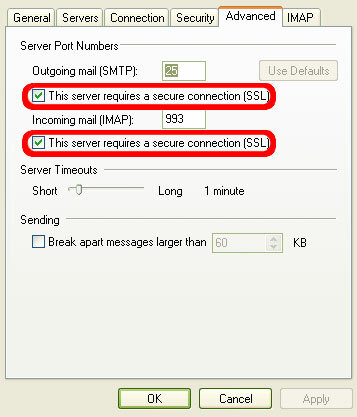 Tick both This server requires a secure connection (SSL) checkbox (Refer to figure below). Change the port number according to the below table.